For all your wedding-guest transportation from church to reception veunue needs. 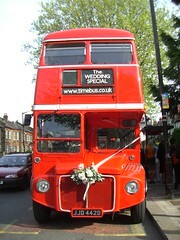 A red London bus wedding special. As you can imagine, this was the highlight of the wedding for me. 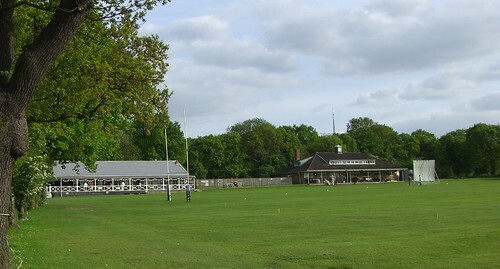 The reception venue in a cricket pavilion, while a match was in progress, was also so wonderfully English that soppiness abounded. This scribble was published on Tuesday, May 5th, 2009. You can follow any banter on this scribble with the RSS 2.0 feed. You can share your inspired musings after typing the anti spam word near the bottom of the page. But no Pinging because its too naughty. A blue diesel mini car called Thomas, a red double decker bus with a bow, I await the helicopter with a cap at a jaunty angle and a potentially best selling childrenâ€™s book series. Pc plod is my anti-spam word, its karma methinks. Perhaps you should marry the next available prince for the sake of increased sales. You do just need Marmaduke the Lorry to make things complete.